2009 is ending being one of the best years for craft beer in barrel aging. The entire industry has embraced aging a wide variety of beers in all kinds of wooden vessels. Great Divide Brewing Company of Denver, Colorado is one of the brewers who are starting to show some success with using Stranahan's Colorado Whiskey barrels with select beers. According to Great Divide's latest December 2009 newsletter, the Denver brewery has released over a dozen new seasonal beers this year, won three medals at the GABF and other competitions and have grown their fermentation capacity by 50 percent. That's a nice accomplishment considering the difficult economic times this year. 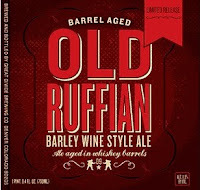 "We're pleased to announce that this year's batches of Barrel-Aged Old Ruffian and Hibernation will be available this month. These (very) limited-edition beers have matured in Stranahan's Colorado Whiskey barrels for nine months, picking up notes of oak, whiskey, chocolate and dark fruit that have transformed these already delicious beers into truly special treats. Barrel-Aged Hibernation is available now, and we'll reles Barrel-Aged Old Ruffian on December 14th (2009); both beers come in 750-milliliter bottles and will only be available in very limited quantities." 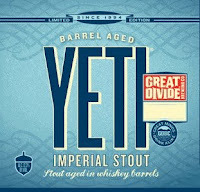 Not to be outdone by those beers, Great Divide has also been barrel-aging their Yeti Imperial Stout and will be releasing a very limited amount of their Barrel-Aged Yeti early next year. If last year was any indication, this new batch of barrel-aged Yeti is going to sell out very quickly. If you see a bottle of this beer you might as well buy it immediately as it might be your only chance to grab one. During the holiday weeks, Great Divide will be open and will continue to host their regular beer and cheese pairings. On December 29th from 5pm to 8pm, Great Divide will again host a Beer and Cheese pairing. For $18, you can get five Great Divide beers paired with five artisan cheeses. But to attend you'll need to RSVP to info@greatdivide.com to reserve a spot. For more info on upcoming releases and events visit their website. Their tap room will be open on Christmas Eve and New Year's Eve as well, but it will be Closed on Christmas and New Year's Day. - Great Divide to release fall-winter seasonals.